Economic Planning of India, German Problem in Europe, Sikh Position in India, Indians Abroad, Genesis of Kashmir Problem, Development of Accountancy Profession in India, Indian Trade Relations with Foreign Countries, Industrial Development of India. He became member of the Executive Committee of the Federation of Indian Chamber of Commerce and Industry in 1931-36 and 38. He was also Founder Member of Indian Chamber of Commerce Lahore and its Hony. 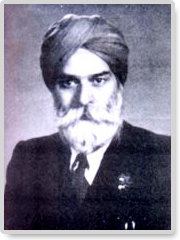 Secretary from 1927-42 and President 1942-43 now known as Northern India Chamber of Commerce & Industry, Chandigarh. He was member of the Executive Committee of the Indian National Committee of the International Chamber of Commerce of Paris, New Delhi-193233, 35, 37, 42, 46, 50 and Elected member of the Council in Paris 1949-51. He was member N.W.R. Advisory Committee in 1933-36. He represented India at International gatherings as a delegate. He was member of Employers Delegation to 20th Session International Labour Conference in Geneva, June 1936. He was first Indian delegate and guest of Honour, to 5th International Congress on Accounting in Berlin, 1938. He was President of Society Registered Accountants in North India 1937-38 and 1941-42. He was also member of Indian Accountancy Board, Govt. of India, 1939-44. He was President Inc Secr. Association (India) 1941-50 and member Executive Committee Indian Economic Association in 1948. After partition he started Delhi Chamber of Commerce in June, 1950 as a national organisation. He was its Hony. Secretary from 1950 to till his last 1970. In between he was elected as President of the Chamber for one year 1954-55. His Name used to appear in International who's who. It is difficult to pen down in details the services of Sirdar P.S. Sodhbans who was a soldier, chartered accountant, economist, political leader, author, journalist, social worker and friend of the poor. There never was a greater defender of the Panth than Sirdar Sodhbans, and country can be proud of this Patriot and servant who always kept the interest of the people above self. By writing his short biography I pay my homage to Sirdar P.S. Sodhbans the founder of this Chamber and I feel priveleged to have been given this opportunity.